Nelli the bear presenting the bear coat. I haven’t still made up my mind over weather to add a belt or some kind of fastener or not, but fortunately, bears aren’t fussy on this point. The inspiration for this bear coat goes a long way back. I once saw a picture of a beautiful silk kimono with a pattern of waves along the hem, and an animal (I can’t remember which) flying or jumping over the waves. Last year in Copenhagen I saw a very similar kimono. And then when Eunny presented her Anemoi mittens I decided this was the pattern that was to be used for a bear coat inspired by the kimono. Anemoi stands for the wind gods in Greek mythology, and you need wind in order to make weaves, so the background to Eunny’s pattern suits my inspiration well. Since I didn’t remember the wind gods too well, I had to check them up, and I got the following explanation: Of the four chief Anemoi, Boreas was the north wind and bringer of cold winter air, Notus was the south wind and bringer of the storms of late summer and autumn, and Zephyr was the west wind and bringer of light spring and early summer breezes; Eurus, the east wind, was not associated with any of the three Greek seasons, and is the only one of these four Anemoi not mentioned in Hesiod's Theogony or in the Orphic Hymns. Additionally, four lesser Anemoi were sometimes referenced, representing the northeast, southeast, northwest, and southwest winds. The bear coat is knitted with Regia silk in dark blue and white on 2 mm dpns. The Anemoi pattern is repeated five times over the coat, and the smaller pattern is used for the sleeves. 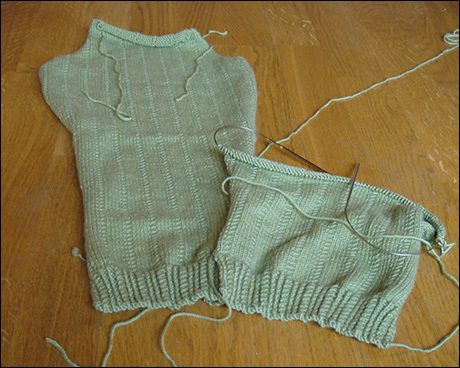 The coat is knitted in the round with steeks, machine sewn in front and in the sleeve openings. Stitches for the sleeves were picked up around the arm openings. The front band is double, hiding the cut edge of the steek. 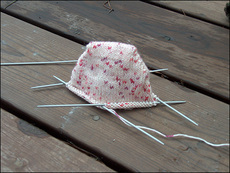 The Seiskari mitten, knitted in Isager Tvinni bought last autumn in Copenhagen, is growing with medium speed. The yarn is a 2 ply merino, and it is very nice to knit with. It's not superwash treated, it’s soft to knit with, and after the first wash it softens even more. 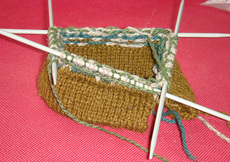 To knit with two colours in this yarn is also no problems, the tension is so incredible easy to keep. It was on the expensive side, if I remember right (but we tend to forget about these details, don’t we) and if I had my currency conversions right (no guarantees here, standing infront of the shelves with Isager yarns can turn even the head of persons with no math problems inside out), but few good things comes cheaply, a rule applicable to yarns also. 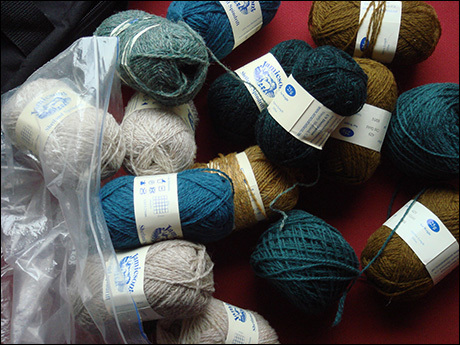 A big problem in acquiring more of this yarn from heaven is however that it is not widely sold over the internet. The yarn is thin; on 2 mm needles I get a gauge of 42 stitches and 42 rows for every 10 cm, and in the patterns in the Isager books I bought it is usually kept doubles. And it is light: one Seiskari mitten, size teenager boy (a small man’s hand I would guess) weights 28 grams, when a mitten in the same size, knitted in thin Pirkka yarn weights 32 grams. So far is my experience of the durability also good: my younger son got his new mittens in the end of the autumn, and they are still like new (this being the same boy who got that terrible hole in his Estonian mittens). The colour work has also stayed very clear, the yarn has not rugged up in use, something that easily happens on mittens, making the colour pattern unclear (this doesn’t happen with Satakieli either, my second favourite mitten yarn). Well, what I’m trying to tell is that Tvinni is at the ten top list of my dream yarns. And did I mention that the colour range was amazing? 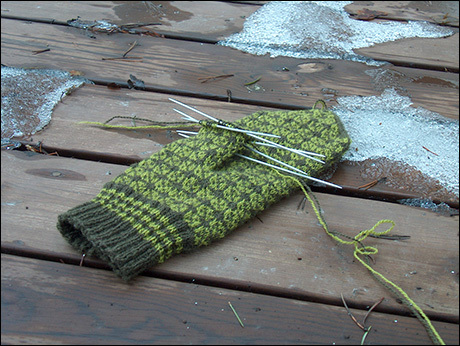 But I have to hurry up with these mittens, and they have got first priority on the WIP list. 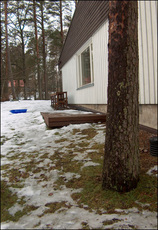 Spring is fast approaching us, as you can see in the mitten picture, taken yesterday at midday. It has been raining and the snow is melting in an admirable rate*. The backside of the rain is of course that the sky is grey all day long. Midday was the light so bad even outside that I didn’t get better light in the pictures than what you see above. Looks like today will be a bit better, as I write this in the early morning the sun is sending some tiny rays of light through the clouds and I can even see some blue sky. *Who me, a winter person? Never. I love spring, no matter how wet and grey it is. Spring brings with it the promise of warmer days, sun, less clothes, gardening. I can stand winter only because I know it makes my children happy to ski and skate, to build snow castles and snowmen, and to generally tumble around in the snow. The bear blanket is finally finished, and the bear is now snuggling up in it every evening at bedtime. And is found, like so many young ones, without the blanket in the morning, happily sleeping. Or this is what I’m told by the bear’s young friend. When I first got the Mason-Dixon knitting book I fell in love with the modern log cabin blanket. I like the colours it’s made up in, and the only reason I didn’t start it straight away was that the suggested yarn, Silky Wool by Elsebeth Lavold, is not that easy to find, and pretty expensive too. I was way too busy to start searching for a substitute yarn, and simply pushed the project to the back of my thoughts. And now I’m pretty happy I did so, since I seriously suspect it would have been one of those never ending projects. This bear version is knitted on 2 mm needles, but the pattern is also shrunk by starting with 10 stitches instead of 76, and by knitting 10, 20 or 30 ridges when the pattern called for 33, 66 or 99 ridges in garter stitch. I think I would have gone crazy with the bigger version; I’m not that a huge fan of garter stitch. I made one small miss with the edge. 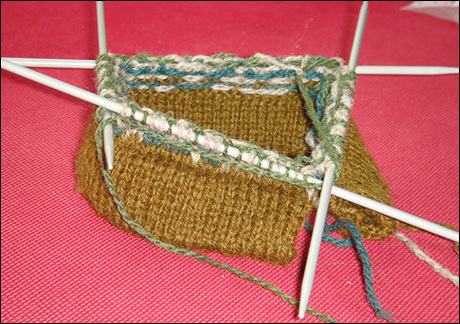 This pattern instructed you to pick up all stitches on the right side, but using the edge instructions of another pattern. Those instructions directed you to pick up the stitches on the wrong side for the edge, and I, blind fool, followed those directions instead of the instructions for the modern log cabin. I realized this when all the ends were woven in, and I didn’t find it worth ripping up all the edges just because that. On a big one I would have done it, but not on this bear version. Pattern: Modern log cabin blanket by Mason-Dixon knitting. Yarn: Sandnes sisu, 80% wool, 20% polyamid. Talking about bear clothing, this is how far I have advanced on the bear coat: there are just miles of interfacing to sew to the inside, and then blocking and thinking about whether or not a bear needs some kind of fastening for the coat, or would a belt be sufficient. And another big question: should I add an opening for the tail or not. The pictures of bear clothes I have made are up in the Bear Gallery. There is a link in the side bar to the pictures! Click here for a close up! The swallowtail shawl was finished last weekend, and it came trough blocking with honour. It passed the quality check, and will be given to the recipient tomorrow. I talked my older daughter (bribed…) into modelling the shawl for me before I’ll dig trough my inventory of gift wrappings and small parcels and fix it up for tomorrow. Patter: Swallowtail shawl from Interweave knits Fall 2006, design Evelyn A. Clark. Yarn: Wetterhoff Sivilla, 70 % wool, 30 % silk, about 75 grams. Needles: 4 mm Addi bamboos. The pattern is well written and in my opinion fairly easy. The nupps are tricky, but not difficult. Using a small crochet hook help making the P5tog. One has only to be careful and push the hook through all the 5 yos and stitches, and not to take the yo not belonging to the nupp as one belonging. I do admit that I more than several times wished all cleaver lace designers and the inventor of the nupp to a place closer to hell than heaven, but when looking at the finished shawl I take back all those thoughts. The nupps are very interesting as element, and lining them up as a lily of the valley results in a beautiful lace pattern. I think the yarn I have chosen is very suitable for this kind of shawl, but I’m a bit surprised I didn’t need more yarn than about 75 grams. All in all a very nice shawl to knit, and I highly recommend the pattern.